The Federal Reserve on Wednesday opted to continue its program of buying $40 billion in mortgage-backed securities each month until the labor market improves "substantially" as the central bank repeated that the "unemployment rate remains elevated." While noting that household spending has "advanced a bit more quickly," the Fed said business investment has slowed and noted that housing has improved from "a depressed level." 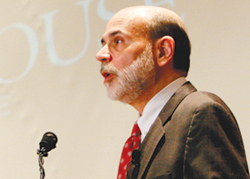 Some analysts say Bernanke will step down in 2014 no matter who wins the White House. The transition could be challenging. “Information received since the Federal Open Market Committee met in September suggests that economic activity has continued to expand at a moderate pace in recent months. Growth in employment has been slow, and the unemployment rate remains elevated. Household spending has advanced a bit more quickly, but growth in business fixed investment has slowed. The housing sector has shown some further signs of improvement, albeit from a depressed level. Inflation recently picked up somewhat, reflecting higher energy prices. Longer-term inflation expectations have remained stable.